1) Have a very detailed and measured plan of attack. Off-season is the time to address areas of your training that need improvement. Whether it is a nagging, repetitive injury that will not go away or a perception that is holding you back, the time to work on your weaknesses is now. Your planning will create a purposeful off-season. 2) Establish a great foundation. Your off-season is the first building block to success in 2015. Be certain that your workouts reflect your needs for your upcoming competitions. 3) Hit the weights. The goal of your resistance training program is not hypertrophy. Your desire is to balance your body and to strengthen your ligaments and tendons in preparation for the tough workouts ahead. 4) Work on making your form the most efficient as possible. My 3 speed workouts per week begin in March, but I work on my sprint form every week in the off-season to compose my entire body for quickness and pop. I am not running with the high school track teams until the spring, but I concentrate on my sprint form during my “give and go” workouts on the beach. 5) Write down your 2015 aspirations. Once you put them in writing, you will begin to wrap your mind around your quest. Every year I begin by saying that I think my aspirations are too big to accomplish, but as the off-season progresses I begin to digest my goals and begin to visualize the process for a successful tour. I believe in the process. My state of mind will be totally locked and focused by the conclusion of the off-season. Just got news that I’m a featured plant-based athlete in the brand new book Vegan Vitality by Karina Inkster. Check it out at https://www.amazon.com/Vegan-Vitality-Complete-Plant-Based-Lifestyle/dp/1629143642. Wishing you the best with your off-season workouts and have a wonderful holiday season! Back in Florida for a few days after training in the northeast mountains for the last 3 weeks. 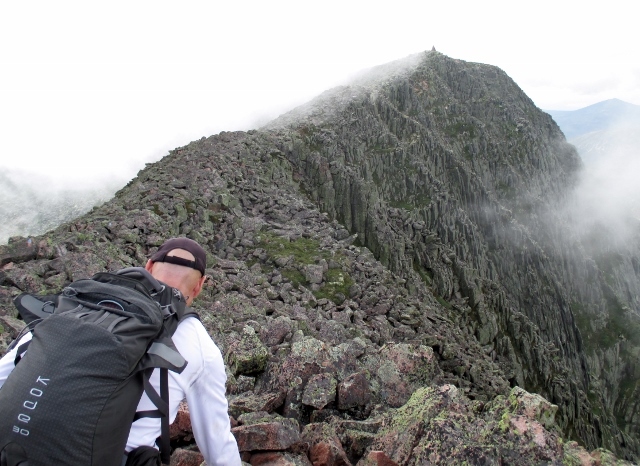 We began at Mount Katahdin, Maine’s tallest peak. Little did I know that I was in store for 9 hours of rock climbing and only 3 hours of hiking as we chose to cross Knife’s Edge (pictured above) – the most difficult route to the summit. 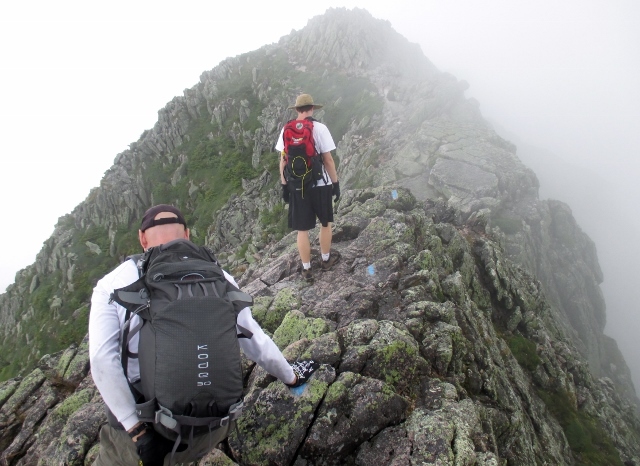 We ascended the rocky Dudley trail to Pamola Peak. Then managed to get through the extremely hazardous maneuvers up and down Chimney Peak to Knife’s Edge (the name does say it all). 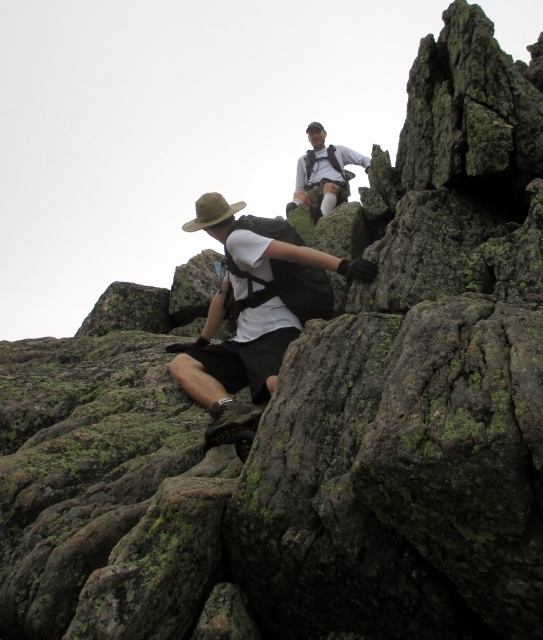 I will never choose to go this route again, but my nephew (pictured in front of me), Braedon, from Arizona loved the rock climbing aspects of the hike. So it was well worth it to experience the journey with him and my older brother, Richard. Braedon who is scared of structural heights (as he will freak out on a 30 foot rock wall with a safety rope around him), but strangely not natural heights. He had to lend me a “helping hand” a couple of times to hoist me up in order to position my foot in the next vertical spot. I left the long day at Katahdin battered and bruised, but void of twists or sprains allowing me to meet Kim Sheffield in the Vermont mountains for our 20 mile training run. 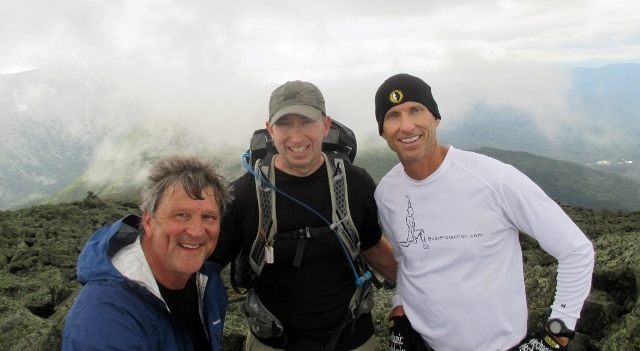 Kim assembled a nice small group of runners to ascend and descend Mount Tom and surrounding areas around Woodstock, Vt.
Then it was onto the White Mountains of New Hampshire to tackle the full Presidential Traverse in the White Mountains that Hurricane Arthur kept us from doing in July. We started at daybreak and hiked 9,000 feet of elevation as we went up and down 7 peaks: Madison, Adams, Jefferson, Washington, Monroe, Eisenhower, and Pierce. It was 21.5 miles in 14.5 hours as we finished with our head lamps guiding us through the darkness. I now can understand how this is more a summer solstice hike as we were chasing the sunlight. It was a long, but beautiful day. My older brother, Richard, and his friend Steve (all over 50 years old) had a lot of laughs along the way and took in some amazing sights. During the hikes Richard and I were discussing the necessity of advanced motor planning for these challenging terrains. Motor planning is defined as “the ability of the brain to conceive, organize, and carry out a sequence of unfamiliar actions.” That is exactly what was required step after step (often on wet rocks). Individuals can be in the best endurance shape, but if they lack advanced motor planning, problems will occur with such arduous routes. That is why jumping rock to rock is as much a mental task as it is a physical one. If you can do the physical, the most difficult part of the game to master is the mental. This is what many athletes miss in their preparation for competitions. I was asked by a reporter the other day about the greatest challenge on The 2012 Isles Mile Challenge and I said “constantly taming my mind on tour.” I feel our minds love to jump around hurting our concentration and focus. Being present focused seems so simple, but yet is so elusive. Our minds jump from the past to the future keeping us mentally weak and hurting our athletic performances. So how do we begin to tame the mind? 1) Stay in the here and now. This race, this point, or this play is all that matters. Every other thought will diminish your performance. Easy to say, extremely difficult to do, but it is something you can learn. 2) The mind-body connection is bridged by your breathing. People laugh at me when they hear me breathe during a mile race (heavily through the mouth and nose), but they also laugh when they hear me perform my breathing exercises for relaxation, focus, and visualization (almost Darth Vader like). Deep breaths through the nose activates the lower part of your lungs and will increase blood flow and increase energy. Longer exhalations than inhalations can also help you relax and calm your entire body. 3) Create habits that keep you in the present. For example, get used to giving your absolute best mental effort in every competition (something you can control) and forget about the outcome (something you cannot control) – it is an amazing zone of performance that you will want to repeat again and again. You will be free to compete at your highest mental level. We wanted to share what we learned in this 2012 Isles Mile Challenge experiment that could help you perform at your peak. Remember this is a “buffet” of ideas, please pick or choose what you want that could help you reach your highest level of performance. 1) TRAINING – Our focus in the spring on running up and down the Ringling Bridge to prepare my body for the up and down conditions of the islands worked out great. 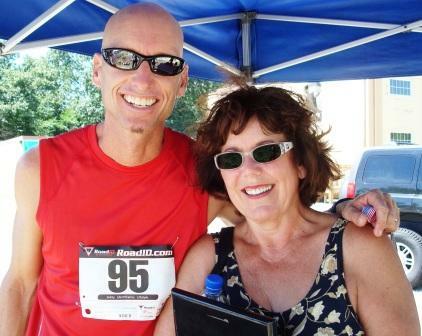 My training buddy, Wayne, and I set up sprint work, tempo work, and interval work on uneven terrains. We live in Sarasota and train most of the time on surfaces that are very flat, we call the conditions “Florida Flat” (as I have raced in California on so-called flat courses, but they are very up and down compared to Florida). 2) RECOVERY – After 30,000 miles of travel through various time zones, my body held up surprising well. With races every week, one pulled hamstring and the tour was over. No Advil or ice was used to recover – just massage therapy and my Body Protection program. During an interview the other day, the reporter did not believe me at first when I said that I used no medicine at all on the trip, but after he heard of my training – he understood. Not only on this tour did I not get injured, but I also did not get sick. My immune system stayed strong throughout the travel. I took my Vega One shake every morning, followed a strict vegan diet, and had no alcohol. 3) RACING – Prayer, visualization, and a present focus mentality prepared me for the various race conditions. Each race was different, but my mind was the same. There were times I spent hours on the road race course going through the turns and 1/4 mile splits over and over. I wanted to feel like I had raced on this new course before. Getting familiar with the conditions really assisted me in my racing confidence. Also,my focus on my racing form and technique really helped me to stay fast and strong. Charlie Olbrias (our official timekeeper) said that I looked as fast as I did 3 years ago when he followed me to 27 races in 2009. My mile race times this year backed up his observations and assertions. Now that the summer is over, it is time to set up your fall training, recovery, and race schedule. Please feel free to ask me any questions on how to optimize your efforts as you try to peak in the last quarter of 2012. When I read that quote it felt true for me, too, and got me thinking about why that is. (I am such a philosopher at heart.) I went where my musings took me and I offer them in the spirit of inviting a welcoming to the power of curiosity. I am passionately curious about life in general, people more specifically, and “how things work”, very specifically; that is, the “why” behind what is. As I contemplated this quote, a variety of notions arose and here they are. Recently I have been on the road delivering sales training to team members in one of the world’s largest and most successful enterprises. At the heart of this training is the concept that the agents be ‘naturally nosy’ when speaking with customers, in order to find out about their businesses and uncover needs for the products and services the agent’s company provides. It has been a common occurrence in most of the sessions that agents are actually afraid of engaging their customers by asking questions, or being ‘naturally nosy.’ At this point, my perception is that some people are not really curious in that way; some people lack conversation skills to engage others; some people are just not really that interested in others (and may be in the wrong job); and / or, people have become so “knowledgeable” that they are no longer open-minded to the world around them. I might go so far as to say that some people are blocked learners and spend a lot of their energy ‘being right’ and resisting ‘new’ information, even when it might help them in some way. That led me to think about the “I know mind.” This mind is the one that knows everything, has everything figured out, and needs to be right a lot. My perception is that this state of mind is the opposite of being curious. In my experience in noticing my own beliefs and behaviors as well as those of others, when one is in that mind, there is usually some kind of conflict going on. To the degree I or another is able to “not know” or “be right” about the contentious topic at hand, an opening results for what Stephen Covey calls the Third Alternative, a way that is better than either of the original two and that both parties can live with. In a very esoteric way, losing the need to be right (or to win), can actually be a pathway to peace – inside an individual, between and among people, and nations, and the world. You get my drift. So then my mind went to “but, there are times when there is no conflict”, just a “knowing” that feels peaceful and right. So, what about that? I do believe there are “knowings” and I resist being complacent about them when they arise because it is just as possible that what I “know” is incomplete at best or incorrect at its relative worst. An example of a knowing I trust and that feels good to me is when I do the right thing in a situation when it is hard to do and inconvenient and I’d rather not do it, but I do it anyway. In those cases, I “know” that the action was right because of how I feel. And, it is not uncommon for me to qualify most of what I say “at this point in time” because I believe expanded knowledge and possible ensuing wisdom are always a possibility, especially with my bent to understand the “why” behind things. As my journey continued, I arrived at the inevitable “why are we here?” and “what is the purpose of life?” questions that I am extraordinarily interested in and curious about. It’s a bit odd, but I do not want to really “know” the answers to those perennial questions as much as I desire to understand at levels I cannot even imagine, which I imagine would mean I am in some kind of communion with the Divine. How may I be an instrument of peace? How may I sow love? How may I pardon (forgive perceived injuries)? How may I have immutable faith? How may I be used for the transformation of despair into hope? How may I seek to console rather than be consoled? To understand as much or more than to be understood? To love as to be loved? At the end of the day, I hold the belief that the “why” we are here is clear: to love and be loved. It’s the “how” we get there, if we ever do, that I am most curious about. Today. For now. And I am open and willing to learn new, more mature and righteous ways to be curious. Tomorrow, or whenever such “answers” are to be revealed. Please check out the short video as Jacqueline and I discuss faith and service in “Around The World In Less Than 30 Minutes.” We will be following up at the conclusion of our tour with another video summarizing what we learned in this journey. One of the great treats at The Beach to Beacon race at the beginning of August was that so many people flew in to Maine to support reaching the half-way point of The SmoothToe New England Marathon…One Mile At A Time. Not only did my title sponsors fly in from Minnesota (Greg Hoscheit – SmoothToe) and North Carolina (John Haigh – Invista), but also one of my One Mile Runner Consultants from Florida, Jacqueline Moore. Jacqueline has been so supportive of me over the years. She has helped me with my mental preparation for many of my events. Here is an interview that we did together about the rigors of our event and how we manage the mental side for peak performance. This year David has set another aggressive goal for himself. I am so excited about the uniqueness of this goal and how David plans to go about executing on it! We will all undoubtedly learn a great deal as things unfold. Are Your Choices Freeing Or Limiting? This 20/20/20<5@45 event really pushed me. Mentally and physically I felt challenged during my 5 months of continued racing. I realized that my life’s interests lie only in attributes that I cannot touch like courage, strength, kindness, etc. I am in the process of working on my third book called Inner Success (update: renamed Creating Amazement). I will be sharing the 20 attributes I learned in my travels. The third reason that allowed me to complete the 20/20/20 quest is having a limitless mental outlook. I am not going to allow my mind to limit me. When I run the mile well, there is pain – physical pain in my legs and lungs and mental pain wondering how much will I take before slowing down. When I am racing the mile, I am never comfortable. I am on that edge of speed that hurts. However, in that uncomfortable place is the internal learning that I desire to experience. It is tinkering on that “fence” of high performance and pain that I learn about myself. These are experiences that I cannot purchase. It is why I race. There are people that tell me not to race so much. They tell me that people at my age should not stress out their hearts by running under 5 minutes in the mile. But I do have a desire to push the boundaries of my own life – physically, mentally, and spiritually. This is where self discovery exists, but I guess I SEE things differently. In my seminars and presentations, I often discuss the power of perception. Perception is how we see events, others, and ourselves. This generates all our thoughts, feelings, and actions. Perception does not describe reality, but it does add meaning to an observation. I use an example of a deer standing on the edge of the forest in my book, Play Better, Live Better. I discuss how I have a farmer, a hunter, and a young girl standing next to me looking out at that deer. The farmer claims that he is scared of the deer venturing in to his garden and eating his vegetable garden. The hunter wants the deer as a reward for his wall after he shoots it. And the young girl says that the deer is very cute and looks like Bambi. The same deer creates three different perceptions. And those perceptions shape how the farmer, hunter, and girl think, feel, and act. Did you ever wonder why one basketball player sees a last second shot as terrifying or threatening and another as exciting or challenging? It all lies in their perceptions. When I hear people talk about changing the way they think (“I am going to have positive thoughts”), feel (“I am going to have a positive attitude!”), or act (“I am going to have good behavior”), I often wonder how long will it last. They have not uncovered the source of their challenges, but have put their energies in temporary fixes. Getting to the source of the problem is the key and perception is the basis of lasting change.